The Wiki Education Foundation officially announced our new partnership with the American Chemical Society (ACS). The ACS mission demonstrates how aligned our organizations are in sharing knowledge: “To advance the broader chemistry enterprise and its practitioners for the benefit of Earth and its people.” We are excited about working with chemistry instructors and students to improve Wikipedia’s coverage of this topic. Wiki Ed launched a new online survey tool, allowing us to create flexible and adaptive question- naires based on what’s already known about our program participants. Our new tool will allow us to focus on specific data collection questions and evaluation needs moving forward, while minimizing the impact on instructor’s time required to complete our surveys. In April,Wiki Ed’s Programs leadership shifted some responsibilities. Dr.Tanya I. Garcia took on a new role as the Director of Research and Academic Engagement. LiAnna Davis stepped into the role of Deputy Director. LiAnna’s responsibilities include overseeing both the Core Programs and Program Support departments and staff. Early in the month,Wiki Ed staff attended the Experimental Biology conference in San Diego to recruit new participants for the Year of Science. The conference connected more than 14,000 scientists from six academic associations. Wiki Ed joined Simons Foundation staff for their Wikipedia edit-a-thon, an opportunity for experts to improve biology content on Wikipedia. During that event, we discussed further avenues of participation for experts, such as assigning students to write articles through our Classroom Program.While in town, we presented to faculty at both the University of San Diego and the University of California, San Diego.We met with more than 100 college and university instructors who expressed interest in joining Wiki Ed’s programs. 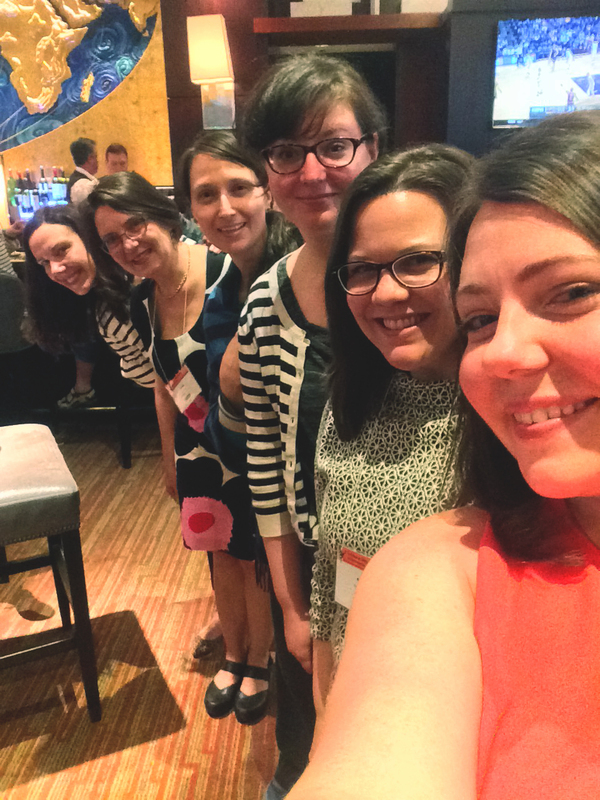 We were also excited to attend the Conference on College Composition and Communication (CCCC) in Houston this month. That conference brings together faculty who teach composition courses. Educational Partnerships Manager Jami Mathewson joined a panel of college and university faculty with experience integrating Wikipedia into the classroom to improve writing skills. That panel included: Dr. Rebecca Thorndike-Breeze, Dr. Amy Carleton, and Greta Kuriger Suiter, from the Massachusetts Institute of Technology, and Dr. Cecelia Musselman and Amanda Rust from Northeastern University. Outreach Manager Samantha Erickson returned to the nearby University of California, Berkeley for a workshop geared toward librarians and instructors interested in either the Classroom Program or hosting a Visiting Scholar. Samantha presented to 28 excited academics. In April, we were excited to announce a new partnership with the American Chemical Society. For the Year of Science and beyond, we’ll work together with ACS instructors to increase public access to reliable scientific research. Students edited 3,970 articles and created 288 new entries. As the spring 2016 term begins to wrap up, we’re reflecting on what has been our most successful term to date. This term, we’ve supported our largest number of courses (212) since the program began, up from 117 courses in spring 2015 and 162 courses in Fall 2015. We’re proud of this rapid growth, which expands the number of students having a valuable learning experience as well as the number of articles being created or improved on Wikipedia. Many of our courses are participating in the Wikipedia Year of Science. More than half of our courses are in the Year of Science cohort (115) and more than half of our students (2,102). So far this group of courses in the STEM and Social Sciences have contributed almost 1.5 million words to Wikipedia and edited almost 2,000 articles. Our Year of Science students are improving content on Wikipedia ranging from the history of Cold War science to neurobiology and from sociology to food science. We’re supporting a larger number of courses this term on the quarter system, so we can expect student contributions to continue through June. As the program expands, quality continues to be our primary focus. Despite our record number of classes, our students’ work is being challenged less frequently on Wikipedia. That’s due to a variety of technological innovations that help Content Experts, Adam Hyland and Ian Ramjohn, catch problematic work before it goes live. Our new training modules and our growing number of discipline-specific handouts are also providing students with targeted and timely support. Finally, we’re making sure that all the classes we support are set up for success from the outset. Classroom Program Manager Helaine Blumenthal carefully reviews all courses submitted through the Dashboard to make sure that the proposed assignment follows best practices for teaching with Wikipedia. Though the spring 2016 term is still going strong, we’re already looking toward fall 2016. Helaine, along with Jami and Samantha, are working together to build on the successes from spring 2016. Our goal is to bring new instructors to theYear of Science, and to make sure that current instructors work with Wikipedia again. Though quiet in the past, we’re expecting the summer term to be busier than before.While most of the instructors we support will (hopefully) be enjoying their summer vacations, we’ll be working with our summer cohort and gearing up for an even larger fall term. Frances “Fanny” Erskine Inglis‘s Life in Mexico, an early and influential travel narrative, was her most well known work. So when Cmartlover from David Sartorius’s Travel Writing in the Americas decided to expand her article, most of the focus was on the work itself. So much so that she decided to build a brand new article for Life in Mexico and summarize that article to expand Inglis’s. Biographies and bibliographies of women expanded at the same time. Well done! Ever wonder why some plants will flower, set seed, and die in a single year while others keep going, sometimes for centuries? A student in Kasey Fowler-Finn’s Advanced Evolution class created a new article which looks at this big question: annual vs. perennial plant evolution. We generally think of fermentation as something that happens when oxygen is absent, but certain yeasts convert sugars to alcohol even when oxygen is present, provided that sugars are abundant, a phenomenon known as the Crabtree effect. The evolution of this phenomenon is the subject of an article created by another student in this class, the evolution of aerobic fermentation. Other articles created or greatly expanded by students in this class in April includeEnchenopa binotata complex, a complicated group of closely-related treehopper species and Nothonotus which is either a genus or subgenus of darters found in the southeastern US. Wikipedia does a pretty good job both with big topics likeevolution and with small granular topics like individual species or organs; mid-level topics are harder to write about, and are generally less well covered. For a biologist who studies plants or animals, discovering a new species often involves a visit to remote locales. As students in Cameron Thrush’s Prokaryotic Diversity have shown, discoveries of new bacterial species can come from far more mundane sites. Nitrospira moscoviensis was discovered in samples taken from a rusty pipe in Moscow, while Desulfobulbus propionicus was discovered from samples taken from the mud at the bottom of a ditch, the mud at the bottom of a pond and coastal mud flat, all in the German state of Lower Saxony. Azotobacter salinestris was discovered surface soil in Canada and Egypt, Haladaptatus paucihalophilus was discovered in a spring in Oklahoma, and Thermotoga elfii was discovered in an oil well. But even prokaryotic species can be discovered in exotic locations – Methanocaldococcus sp. FS406-22 and Thermoplasma volcanium were discovered in water collected from hydrothermal vents. Of course, we mostly associate bacteria with disease, and students also created and expanded articles about disease-causing organisms: Leptospira noguchii is discovered in the aftermath of an outbreak of fever in Fort Bragg in 1942 Treponema socranskii was discovered in the gums of people with periodontal disease, and Mycobacterium elephantis was discovered in the lungs of an elephant which had died of chronic respiratory disease. Dustin Hamalainen’s Money and Banking course created or expanded several articles on schools of economic thought, financial and credit mechanisms as well as credit events. These areas are characterized by relatively sparse literature available online and (like many other academic areas) considerably better coverage in trade and discipline specific journals. This is the same course which added a solid article on an overlooked bit of banking legislation, so it is good to see a category like this being filled out. If you’re taking a neurobiology class, you might be curious about the type of scientist who actually studies this field. Students in Michelle Mynlieff’s Neurobiology class expanded Wikipedia’s short neuroscientist article, adding information about the history of the field, the nature of the job, current areas of research, and notable neuroscientists. Other students expanded articles ranging from SLC7A11, a gene which encodes a glutamate transporter to camptocormia, also known as ‘bent spine syndrome’, a condition often seen in elderly people. The SLC7A11 was expanded from a short stub into a substantial article discussing the role it may play in drug addiction, schizophrenia, and neurodegenerative diseases; the camptocormia article was expanded from a three-sentence article to discuss the history of the disease, the ways it is diagnosed, and some of the causes, treatments and current areas of research. Other major articles expanded by students in this class include caffeine-induced anxiety disorder, Adipsia (the lack of a sensation of being thirsty), dysembryoplastic neuroepithelial tumour (a benign brain tumor) and the Sympathoadrenal system. German dialects and local groupings are all the rage for Monica Macaulay’s Language Endangerment and Revitalization course. Her students have added to the Cimbrian language, a variety of German spoken in northern Italy; Walser German, a grouping of German dialects spoken in Switzerland; and created a new article, Wisconsin German on dialects spoken in, well…Wisconsin. Beyond historical coverage, the students have added phonology and orthography tables and information for these and many other languages, looking to existing linguistics articles (some created by past students!) for guidance. Students in Peter Barker’s Cold War Science took Wikipedia on a tour of some of the stranger elements of the nuclear arms race during the Cold War. One new article detailed Green Light Teams, US Special Forces teams who were trained to deliver backpack-sized nuclear weapons behind enemy lines and detonate them under conditions that led them to be considered probable suicide missions. Another new article discussed the 69-year history of Soviet rocketry. Students also expandedOperation Hardtack I which discussed a series of 35 nuclear weapons tests conducted primarily in the Marshall Islands and RDS-37, the Soviet Union’s first two-stage hydrogen bomb. We’re happy to announce that Whittier College is joining the Visiting Scholars program. The college’s Digital Liberal Arts Center is sponsoring a position named after Adrianne Wadewitz, a feminist scholar and noted Wikipedian who died in April 2014. Adrianne was known for her work on Wikipedia’s gender-related challenges, and Whittier’s primary interest in sponsoring a Visiting Scholar is to improve coverage of women in the encyclopedia. 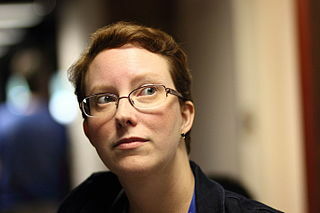 Adrianne was also a champion of Wikipedia in education, served on Wiki Ed’s Board of Directors, and was set to start a full-time position at Whittier in the summer of 2014. Current Scholars continue to produce great work. Gary Greenbaum,Visiting Scholar at George Mason University, brought two articles to Featured Article status this month. First, Huguenot-Walloon half dollar was promoted on April 14.The article about the 1924 commemorative coin had gone through the Good Article process back in October. Second was the renowned children’s novel The Phantom Tollbooth, promoted on April 23. Current Scholars have added almost 40,000 words to more than 350 articles viewed 27.3 million times. Community Engagement Manager Ryan McGrady has been fostering relationships with several other prospective Visiting Scholars sponsors at various stages in the onboarding process. He also spent time in April starting a database of potential Scholars for recruitment purposes, and began an outreach campaign to some of the site’s most experienced editors. LiAnna Davis attended the Wikimedia Conference, an annual gathering of staff and board members of global Wikimedia organizations. She participated in the track on program impact, presenting on Wiki Ed’s Classroom Program viewed through the lens of a logic model.While at the conference, LiAnna advocated for the use of Wiki Ed’s Dashboard software by other Wikimedia organizations, and exchanged learnings about education programs with program leaders from other countries. Communications Manager Eryk Salvaggio has been developing materials to strengthen our resources in the Fall term. This includes a re-evaluation of existing materials, and a coordination with staff to design new ones, based on outcomes from the end of the Spring 2016 term. Eryk also worked with Product Manager, Digital Services, Sage Ross to create the online survey for instructors. In April, we rolled out the Wiki Ed Dashboard’s survey features, and kicked off the Spring 2016 instructor survey.The Dashboard’s integrated survey tool gives us the opportunity to ask questions based on the specific details of each course, such as the set of articles edited by the students.We’ll also be sending out invitations to take the survey based on the dates of the course, so that each instructor is invited to take the survey soon after their course ends. Alongside our work on surveys, we made several improvements to the user experience for instructors. Instructors now receive an automatic confirmation email when they submit a course, which clarifies the next steps and identifies the Wiki Ed staff who will be supporting them. The Articles tab, which summarizes student work for a class, has been adjusted to present the data in a more useful order by highlighting the most active articles first. The Students tab can now be sorted by students’ real names (for the instructor only). 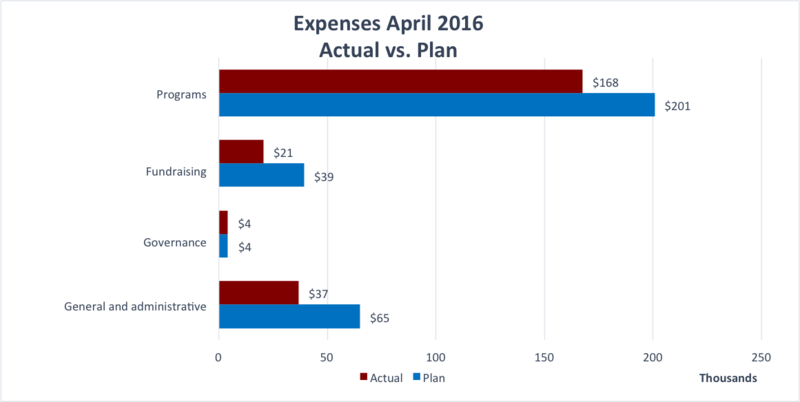 For the month of April expenses were $229,354 versus the plan of $309,556. Our earlier decision to hold off on expanding our office space and growing our staff continues to be the main cause of our monthly variance. Our Year-To-Date expenses are $2,453,035 versus the plan of $3,090,833, resulting in a variance of $638k.The decision to hold back planned expenditures until long-term funding is secured accounts for 95% of the variance. The remaining variance is a result of the timing of expenses. 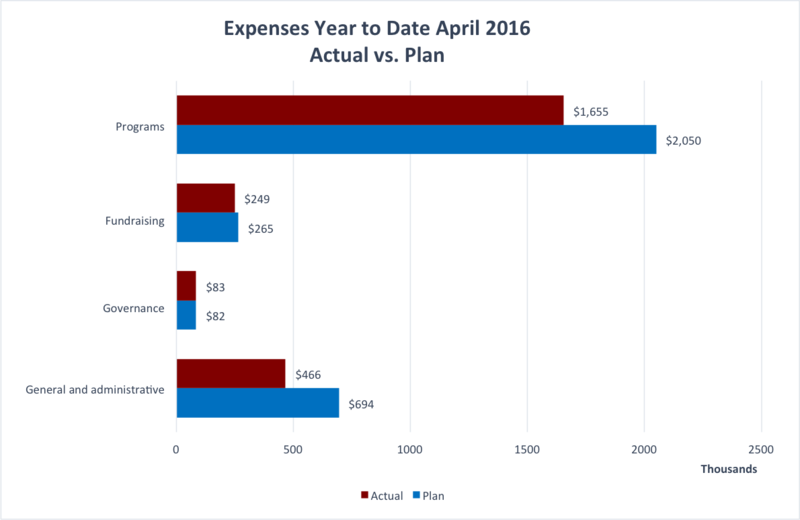 ￼ Our spending level over the last 3 months has remained steady at 79% of our planned budget. April began with a whirlwind of follow up related to our March 28 event in the Presidio.Wiki Education staff have conducted engagement meetings with prospective funders and connectors. As a direct result of this campaign, Wiki Ed received its first major gift pledge from an individual, Franklin “Pitch” Johnson, Jr. This gift will qualify for the current Stanton matching campaign, because Mr. Johnson was introduced to us by Board Member and Presidio event co-host Lorraine Hariton.This means that this significant gift will have twice the impact for our organization. Also in April,Tom Porter began soliciting proposals from communications firms for a planned major donor communication and activation campaign. The campaign, which is scheduled to begin in July 2016, will more clearly define the Wiki Education Foundation value proposition and illuminate pathways to prospective donors. The overall goal is to create lasting and measurable support for Wiki Ed. To learn more, view the request for proposals here. The simplicity and tranquility of the Green Gulch Farm Zen Center serves focused work and thorough reflection. The three-day retreat at the Zen Center enabled us to create alignment around the annual plan for next year. April was dominated by the senior leadership team’s work on the annual plan of budget for fiscal year 2016–17. 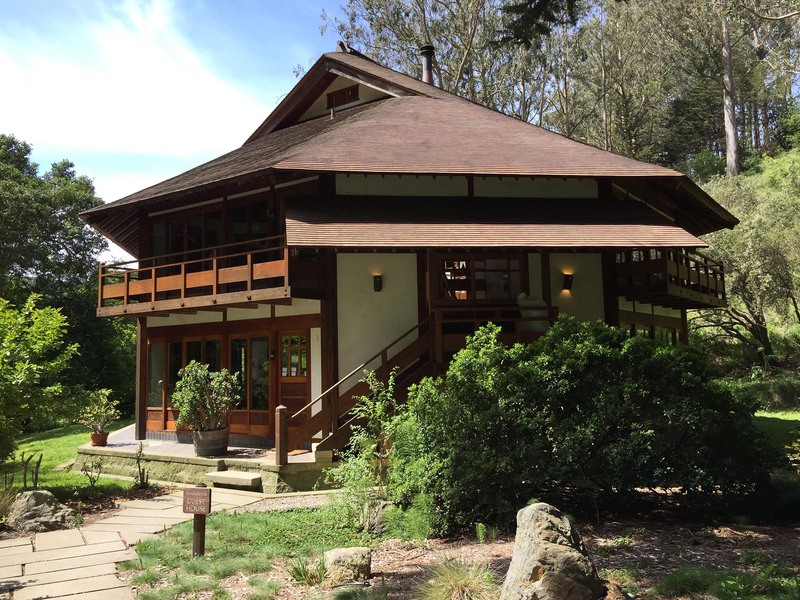 As part of the work, LiAnna, Tanya, Bill, Tom, and Frank spent three days at the Green Gulch Farm Zen Center north of San Francisco.The meeting created a shared understanding of the key initiatives for the upcoming fiscal year. It also offered the opportunity to reflect on this year’s achievements and to engage in discussions around the culture of our organization. As a result of the meeting and the subsequent work, we were able to send the first draft of next year’s plan and budget to the board on April 29. Also in April, Frank had meetings with potential individual donors and people who could connect us to contacts in their network. Frank also met with members of Wikimedia’s development team in order to coordinate efforts in the area of major donor fundraising.